Bald Porcupine Island (seen on the right side of the above photo taken from Cadillac Mountain) is located in Frenchman Bay between Mount Desert Island and Schoodic Peninsula on the coast of Maine. A distinguishing feature is the breakwater that stretches outward to the west toward MDI. 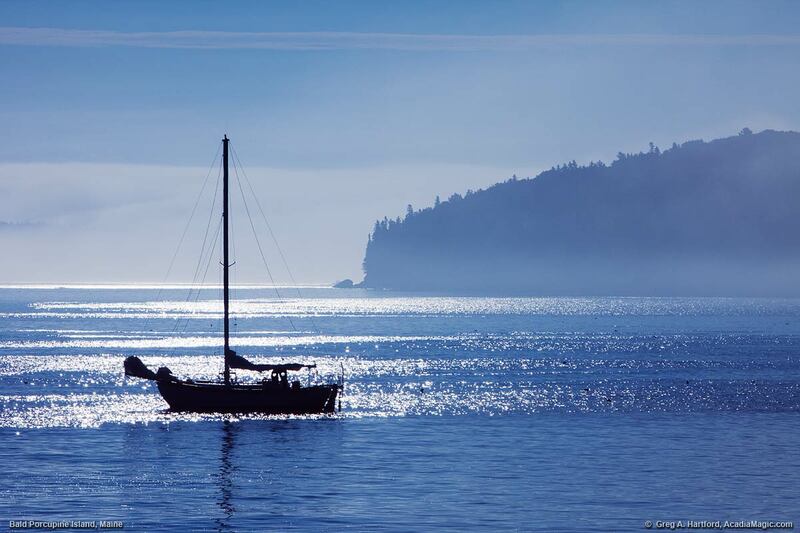 Without it, Bar Harbor would not have a safe harbor. 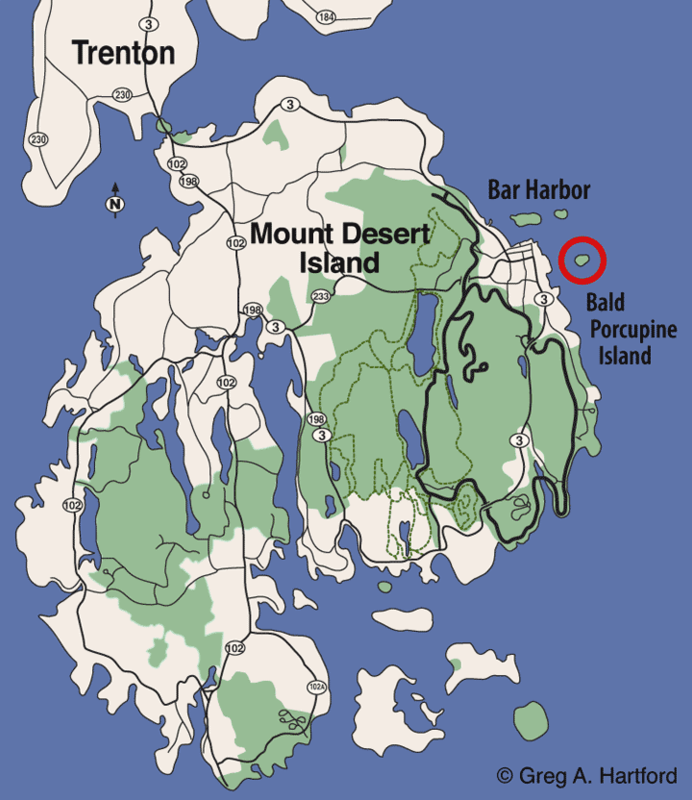 Bald Porcupine Island is actually in Gouldsboro, Maine and part of Acadia National Park. Most of its 32 acres are covered with a mature spruce-fir and deciduous tree forest. Bald eagles and other nesting birds nest here so it is closed February 15 through August 31 of each year (or, until a park wildlife biologist determines that nesting is no longer occurring). You will notice that, like most of the mountains and other land formations in this area, the northern side has a gentle slope whereas the southern side almost appears to “fall off.” This was not just by chance as it was caused by the continental sized glaciers that migrated from north to south, shearing off the tops of the mountains and other land formations. As the glacier pressed with its incredible weight against the mountain, it scooped up materials and pushed it along until it reach the downside where it was deposited. You will find this type of geological feature all over coastal and interior Maine. 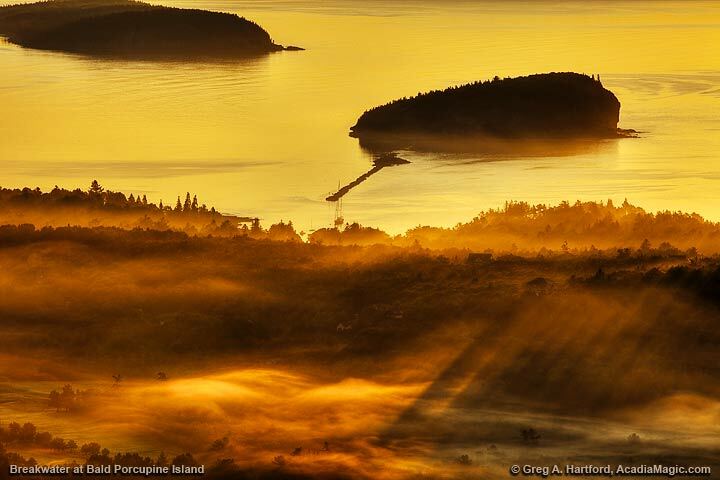 The island directly behind Bald Porcupine Island to the West in some of the images above is Long Porcupine Island. The one to the left is Rum Key. Sheep Porcupine Island is on the North side. The one behind Long Porcupine Island is called Stave Island, also part of Gouldsboro, and part of what is often called the Down East Schoodic Region of Maine. The only portion of Acadia National Park located on the mainland is on the Schoodic Peninsula. For a large group of people, this is a preferred part of Acadia National Park because of the smaller crowds that go there. This area is well worth exploring if you are not familiar with it. Chances are usually good that there will be some good ocean wave action. 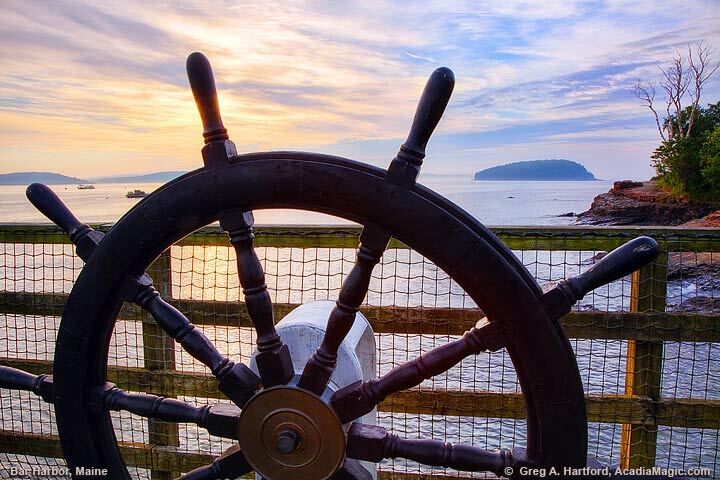 Many visitors to Cadillac Mountain have viewed the breakwater extending out form Bald Porcupine Island toward the shore of Bar Harbor, Maine on Mount Desert Island, but far fewer people understand or appreciate the significance it has had for the port. Like the name applies, it breaks the normal ocean waves that come toward the harbor, allowing much more safely for vessels and commerce. Viewing it from Cadillac Mountain in Acadia National Park gives the best perspective. You also get some great views from the Bar Harbor Public Pier and especially along the Shore Path.